Xenophobia rules in Northampton as the local paper advises consumers not to employ builders who ‘don’t have a local accent’. This is under the heading ‘Dodgy and Dangerous’. Oh dear! 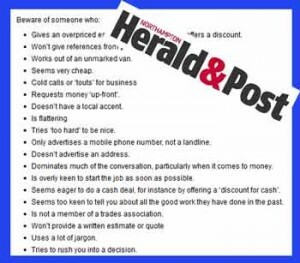 The Northampton Herald and Post is advising it’s readers on how to avoid cowboy builders in response to a report from Sainsbury’s Home Insurance which highlights how big the problem of rogue traders actually is in Britain. Sainsbury’s report shows that more than 6 million homeowners have suffered from botched building jobs in the last 5 years at a cost of some £3.7 billion. You know we are always improving our information about avoiding cowboy builders here at DIY Doctor. Much of what the paper has to say makes sense, but this is one piece of advice that we have never seen before. We won’t be adopting this advice as part of our Home Improver’s Protection Solution, because we believe that people should be free to move around the country, and even around Europe, providing the service they are offering is a good one. Go to our Home Improver’s Protection Solution pages to find out how you can really find a good tradesman and avoid Cowboy Builders. This includes free tools such as find a tradesman, Price Doctor quote checking tool, and the Desired Outcome Contract to use with your builder. There is also lots of advice on our You Tube Channel – including a seminar from our Managing Director Mike Edwards which deals with avoiding the cowboy. Click play on the video below to see what he has to say.